Media, Branding and Sales Enablement. Eleven years ago we established Stream Creative with a clear vision – work with good people and help their businesses grow through progressive website development, persuasive branding, design and establishing a strong digital presence. Over the years our tools, services and methodology have evolved, to include inbound marketing strategies but our mission has always remained the same. We’ve taken our Midwestern values global and feel humbled to serve so many incredible businesses as an extension of their teams. Let our client partners tell you how we can also help a company just like yours. We are proud to be one of the Midwest’s earliest adopters of the inbound marketing methodology and a HubSpot certified Milwaukee inbound marketing agency since 2010. 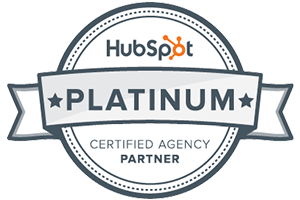 Now a HubSpot Platinum Partner Agency, our team is committed to helping our clients leverage all the software platform has to offer to help steer data-driven inbound marketing strategies and solutions.